If you’re from Louisiana, there’s a chance your last name has a Cajun origin. And if your name is Cajun, your ancestry may be partially or completely French. Although factors like lost male heirs or family migrations can pose challenges to putting together a comprehensive family tree, it’s safe to say that the roots of Cajun names can be traced back to Acadia (Canada), where French families settled in the 16th century. 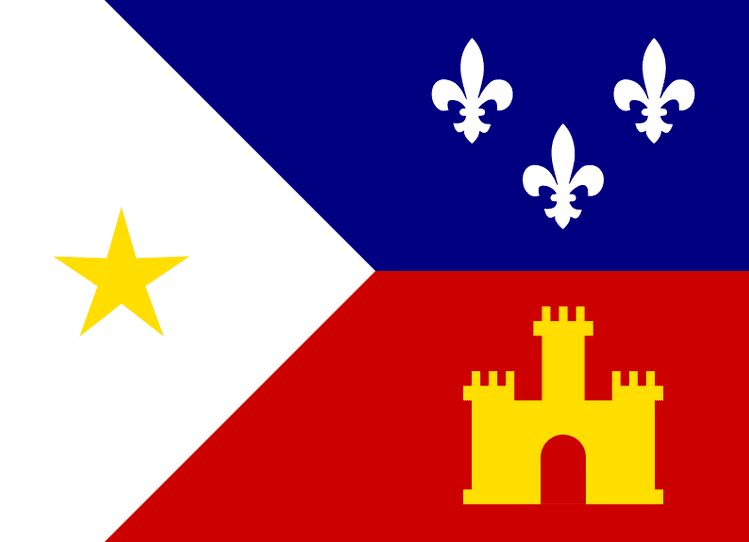 Illustration: the Louisiana Acadian flag, designed by Thomas J. Arceneaux. Credit: Lexicon; Wikimedia Commons. As with other last names with European roots, common Cajun last names often reflect back to the regions in France from where settlers originally left, mainly Paris, Brittany, Normandy, and Basque Aquitaine. Historically speaking, last names tend to stem from either a person’s trade or a repurposing of their father’s first name. Cajun names are by and large French, yet French names often have German roots due to the fluidity of borders that have reimagined nation-states over time. Learn more about some of the common last names in this list, and use them to trace your family history using stories found in Louisiana newspaper archives. Broussard: from the French “bushman,” the name is originally from the southern French region of Languedoc. There are many variants of this name which include, but are not limited to, Brousset, Brousse, Brussé, Brusey, Broussette, or Brosset. Guidry: of French origin, Guidry stems from a first name with the Germanic root “waido” meaning “hunt.” People with the last name Guidry are said to be descendants of a farmer, Claude Guédry dit Grivois dit Laverdure, who was living in Acadia by the time of the 1698 census. Hebert: from the German compound of “heri” (army) and “berht” (famous), the name Hebert means brilliant warrior. Spread to northwestern France first, then to Britain via the Norman Conquest of 1066. The name found its way to Acadia in the 17th century. It is the most common Cajun last name in Louisiana. Landry: from the Germanic first name Landric, “land” (land) and “ric” (powerful), the name Landry means powerful landlord. People with the name Landry were primarily farmers in France. The name later traveled with the Normans to Britain, and much later to Acadia. Today, it is one of the most common Cajun last names in Louisiana. LeBlanc: common in northern France where people are typically rather pale, the name refers to white hair or a fair complexion (“blanc” is “white” in English). Note that on the other side of the country, in the southern region of Provence, orphaned children were often given the name Blanc. Records of the Great Expulsion of 1755 reveal that people by the name of LeBlanc were imprisoned in a church before being deported. Acadia spread across Maritime Canada, but also Quebec and parts of Maine. Henceforth called Acadians, these early French settlers lived peacefully alongside the Wabanaki Confederacy, a collective of Native American nations that had banded together in the area. How did the Acadians move from all the way up North down to Louisiana? The ultimate cause was due to rising political tensions between the British and the French, twin rulers of the region. Acadians refused to take the oath of unconditional allegiance to the British Crown and resisted British rule for 45 years with support from the Wabanaki Confederacy, who helped them by conducting raids. During the French and Indian War of 1754 to 1763, the British decided to remove the Acadians to neutralize the area, and Acadian villages were burned to the ground. The English in command spoke of purging the region. English troops rounded up and arrested thousands of Acadians, confiscated their property and livestock, and deported them. Known as the Great Expulsion, and recognized as the “Great Upheaval” by Queen Elizabeth II in 2005, Acadian families were separated and scattered in waves of deportations. Many died from a combination of sickness and starvation, or in shipwrecks. Those who couldn’t escape to the North were shipped off down to the Atlantic coastal colonies, from New England to Georgia. They were also deported to England, France, and even Portugal. The French government worked to resettle the Acadian refugees, although some plans failed. A project to send Acadians to colonize southern America is one example of a number of failed plans. The death rate for these difficult journeys was very high, and the commitment to them from the French government was low. Other Acadians, disheartened by the poor conditions made available to them in Europe, braved the Atlantic once again to return to Acadia. Others stayed in Atlantic coastal regions in France, particularly Brittany. Faragher, John Mack (2005). A Great and Noble Scheme: The Tragic Story of the Expulsion of the French Acadians from Their American Homeland. Pritchard, James (2004). In Search of Empire: The French in the Americas, 1670-1730. I had never read something like this. Thanks for your kind comment, Kavleen; we’re glad you enjoyed this article!